We at The Filipino Investor keep asking our selves on how else can we empower the other Filipino Investors out there who have no access to relatively more sophisticated analytics in making more informed investment decisions. We believe that by getting them more informed on the companies they are following and giving them facts through numbers will yield into making them better Filipino Investors. 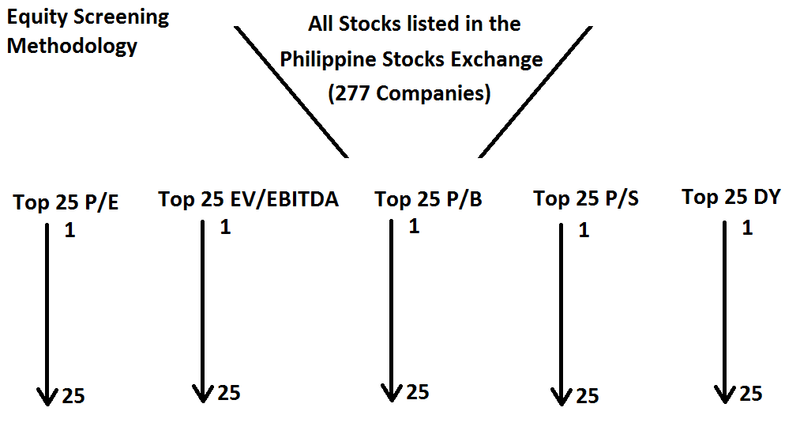 So aside from our Monthly "Dividend Ex-Dates in the Philippines in the Next Three (3) Months" we will now also be publishing "Top 25 Cheapest Stocks in the Philippines" to give them a sense on what are the cheapest stocks at the current market prices. This will be particularly useful to value investors a.k.a those investors who like to buy companies whose current market price is selling cheap relative to quantifiable metrics such as earnings, sales, book value, dividend etc. We would like to remind the readers of this website to do due diligence before investing specially on the more illiquid names. Cheers and enjoy! Sensya sa late reply, anyways, the Dividend Yield data quoted above are coming from Bloomberg's "Dividend Indicated Yield - Net"
Yes, hindi kasama ang stock dividends and property dividends in the calculation as "Abnormal Dividends" are excluded. "The most recently announced net dividend, annualized based on the Dividend Frequency (DV016, DVD_FREQ), then divided by the current market price. If the security is paying an interim/final dividend, then the indicated yield is calculated by adding the net amount from the most recently announced interim and the most recently announced final, and dividing the sum by the current market price. Abnormal Dividends are not included in this yield calculation." Hi - this is an amazing list! Just wondering, how were you able to get the data involved? Is there a free source for the data? I used Bloomberg Terminal to screen the data. However, I regret to inform you that Bloomberg Terminal access is not for free. But don't worry because we at The Filipino Investor intend to publish this information on a monthly basis to guide you in your investment process.